Foreign coins, like this triple-dated 8 reales cob or "piece of eight" from the 1650s (left), minted in Latin America under Spanish authority, circulated widely in the early American colonies. Before the introduction of federal coinage in the 1790s, most of the former colonies contracted for the manufacture of their own coins, like this 1787 "copper" from Connecticut, right. Photo by Leon Worden / The Signal. efore the United States became independent and started to mint its federal coinage, many types of "colonial" coins were issued by some of the colonies. Due to a shortage of small change and the general use of wampum, or Indian bead money, the Massachusetts Colony issued its first coinage in 1652. These consisted of rather crude silver pieces in the denominations of threepence (only one is known to exist today), sixpence and shilling. Each piece was stamped with the denomination on one side and "NE" for New England on the other. From 1653-60, these crude pieces were replaced with better-detailed Willow Tree coinage, so called because of a rather willowy looking tree on one side. Again they came in three denominations in silver  threepence, sixpence and shilling. Modified "Oak Tree" versions were issued from 1660-67 and included twopence, threepence, sixpence and shilling. All of these coins are quite scarce and, in "very fine" (VF) condition, are quite rare and valued in the thousands of dollars. Perhaps the most famous of the colonial issues is the "Pine Tree" coinage from 1667-82. These were issued in denominations of threepence, sixpence and shilling. Maryland was the second colony to issue coinage. In 1659, Maryland issued a short-lived series of silver coins featuring Lord Baltimore on one side. Denominations included a copper penny (only one known), a fourpence, sixpence and shilling. All are very scarce and in high grades, very rare. Catalogue prices in VF run from $5,750 to $10,000, and considerably higher in "extra fine" (XF) to "about uncirculated" (AU) grades. New Jersey issued copper coinage in denominations of half-penny and penny featuring St. Patrick on one side. Although made in Ireland, they were given legal tender in New Jersey in 1682. General colonial-use coins under patent to William Wood included a series of copper pieces with the motto "Rosa Americana," issued from 1722-33. These coins were also legal tender in Ireland. Many coins of France, the Spanish American colonies and many trade tokens issued by various agencies were also accepted as colonial currency, but not authorized as colonial coinage. In 1773 the Crown authorized Virginia to issue a copper half-penny. A rare 1774 silver shilling was also issued (six known). 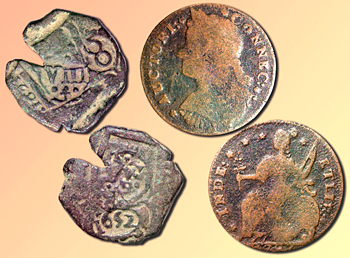 Several copper tokens dated 1694 circulated in the Carolinas. They featured an elephant. Following the Declaration of Independence and well before the federal monetary system was established, a wide range of copper and silver pieces was struck by some states and by the confederation of states. New York issued a series of half cents and one-cent coins featuring and Indian on one side and an eagle on the other. Connecticut issued a variety of one-cent pieces similar in style to the English coppers of the period. A New York goldsmith, Ephraim Brasher, struck a few gold doubloons as patterns for future United States coinage. These pieces are valued at about $1 million as "America¹s first gold coinage." New Jersey issued a series of copper coins from 1786-88 featuring a horse head on one side and a shield on the other. Vermont issued a number of copper pieces at this time, also of similar English coinage style. A number of private companies issued tokens that served as small change; Talbot, Allum and Lee cents are very popular with collectors for their style and craftsmanship. Nice specimens can be found for under $1,000. The handsome Middleton tokens circulated in 1796 in Kentucky. Many variations of George Washington tokens circulated in the colonies even after the start of federal coinage. Washington personally rejected the imperial idea of a president and refused to have his features on circulating coinage. The first federal coinage  undated Fugio cents  were authorized in 1787 and featured a sundial on one side and a ring of 13 interlocked links. Believed to have been designed by Benjamin Franklin, they often are called "Franklin cents." Two mottoes appear on the coins: "Mind Your Business" and "We Are One." When the Philadelphia Mint opened in 1792, several silver and gold pattern designs were submitted with the symbol of Liberty as a prominent feature, along with an eagle. Colonial coinage circulated for some years into the next century until the federal coinage caught up with the demand. Foreign coins were considered legal tender well into the 19th Century. The story of colonial coinage includes volumes on some of the individual colonial issues and considerable research on the tokens used in commerce at the time.